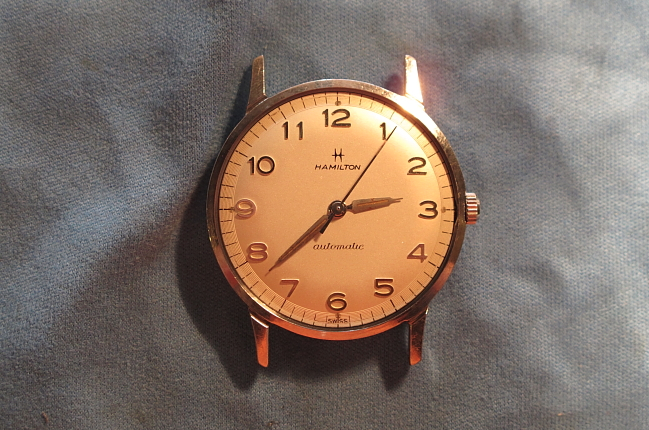 I recently overhauled a 1963 Hamilton Accumatic A-502. The A-502 was only available in 1963 and 1964. Being a 5XX series watch, you know that it has a stainless steel case. It was available on a bracelet or a strap. A lot of folks try really hard to put the right bracelet on their watches. I think doing so really brings to life the design intentions originally created by the watch designers. Of course, it also represents an even greater challenge in the world of collecting vintage watches. Me? I'll stick with a nice lizard strap, thanks. 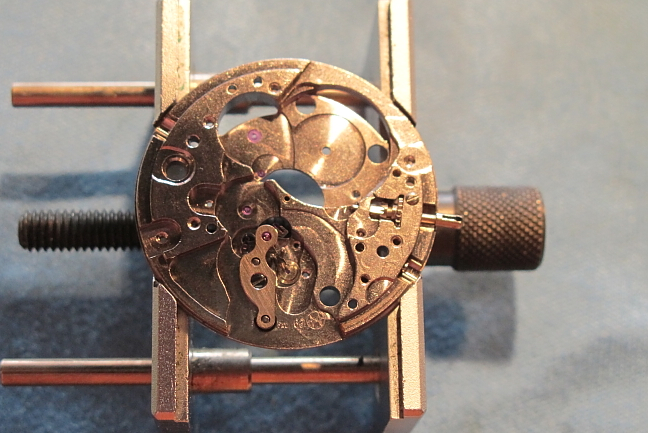 Fine mechanical watches need regular maintenance and should be serviced every 3-5 years. A service generally means the disassembly and cleaning of all the parts, then the oiling and lubing of friction areas and reassembly. 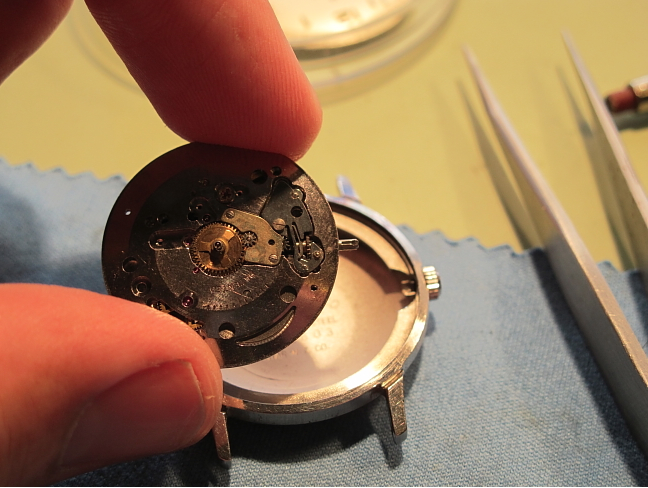 After servicing, the watch timing should be checked to make sure that it works as it should. A lot of things can upset the timing of a watch. 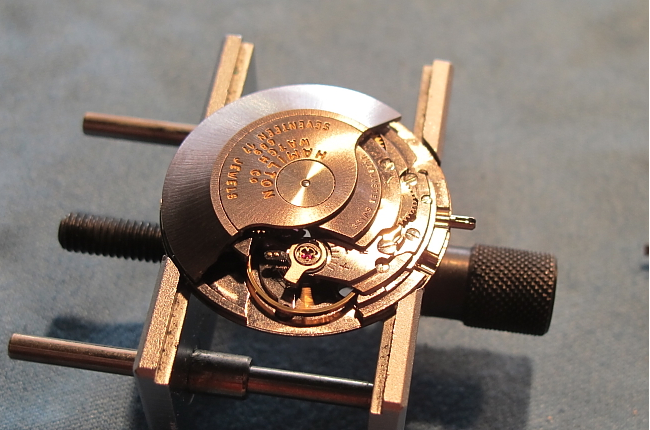 Even a smudge of oil on the hairspring will throw off the beat. To show you what it takes to overhaul an automatic, let's start with the A-502 as received. This one is in nice shape overall. This type of watch opens through the crystal. A special tool compresses a bunch of fingers around the circumference of the crystal and draws the diameter in so the crystal can be pulled off. With the crystal removed the next step is to remove the hands. With the dial removed you can see the female portion of the two-piece stem. 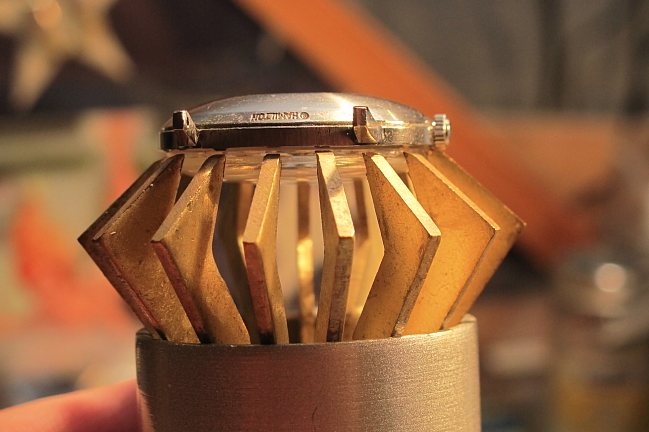 The slot embraces the male portion still in the watch that is attached to the crown. Getting the movement out is pretty tricky because you have to line everything up but you can't see it very well with the dial in place. 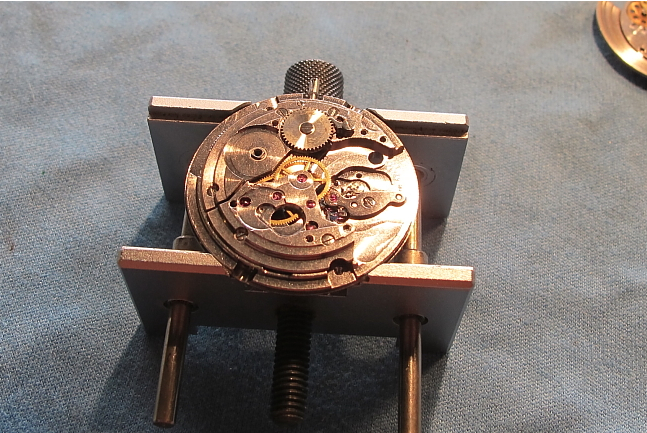 Next step is to remove the hour hand wheel and the canon pinion (that the minute hand attaches to). 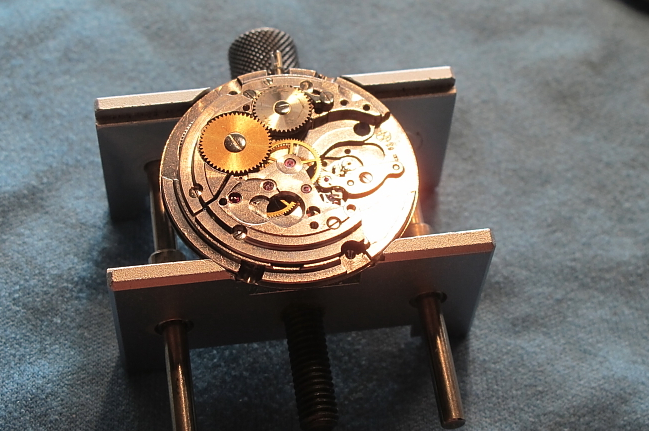 Flipping it over, you can see the rotor on the back of the movement. As this weighted rotor swings around it winds the watch using a gear train beneath it. Two screws hold it in place - you can see one of them at about 9:00. 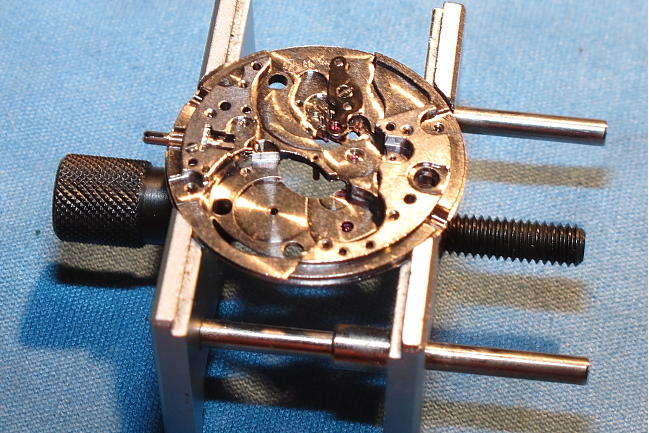 With the rotor removed the watch now looks like a typical manual movement - albeit with a few extra holes here and there. 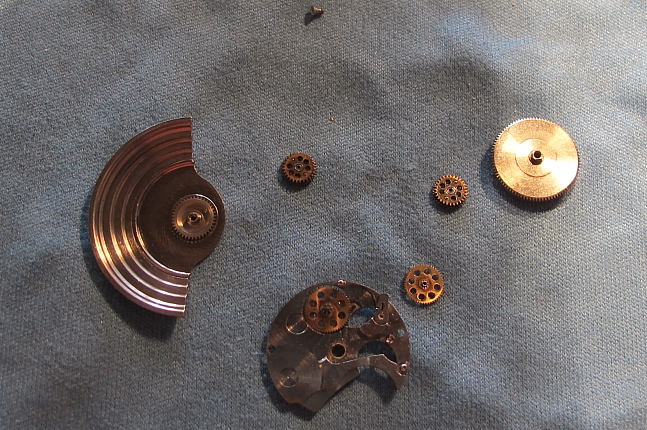 There are a bunch of parts still attached to the rotor. They should be removed, cleaned and oiled like everything else. 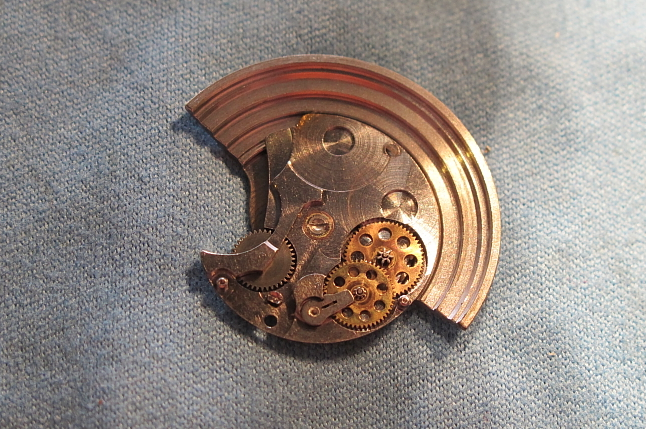 With the mainspring tension fully let off, the barrel bridge can be removed and reveal the mainspring barrel. The train bridge comes off next, revealing the four wheels. Once they're removed you only have the balance assembly and the pivot fork left on this side. The balance is removed and now there's only one screw left. It holds the pivot fork bridge in place. The rotor can be fully disassembled too. Once all the parts are cleaned in the ultrasonic cleaner they must be dried. At this point we're ready for oiling and assembly. Every bearing surface gets a small droplet of Moebius oil. 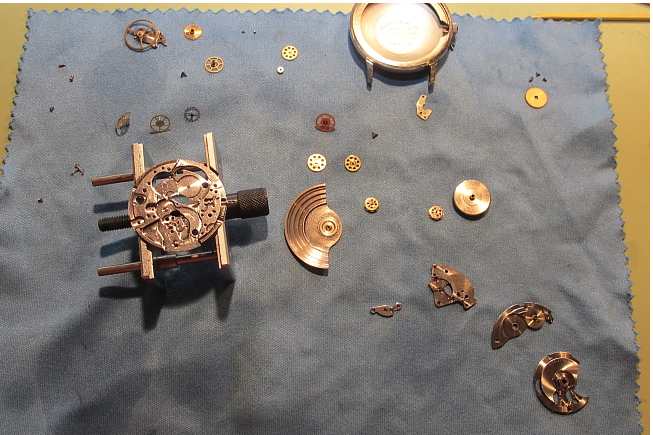 Reassembly follows the reverse of disassembly, except the balance goes on a little later. First step is to put the pallet fork back in. Now all four wheels are re-installed and I put the mainspring barrel and barrel bridge back on to aid the next step. The train bridge connects all four wheels and getting each of the four pivots to line up with their respective jewel takes a steady hand and a lot of patience. Each jewel is oiled before installation. The reason I put the balance on later is so that I can see which wheels need to be aligned and get my tweezers in there to move them. I always breath a little easier at this point. 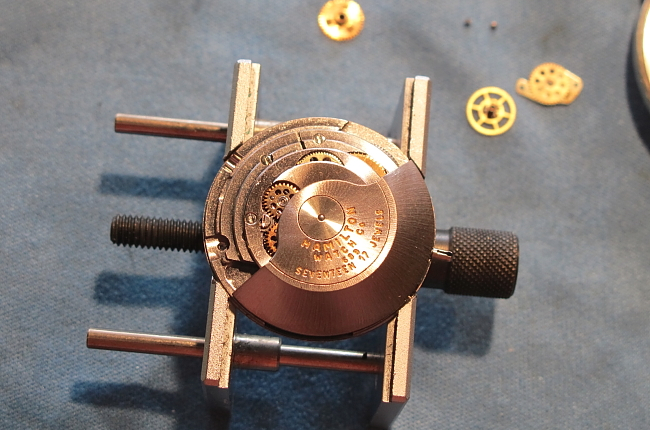 Put the mainspring winding wheel back on and you can add tension to the mainspring and gear train. The pivot fork holds the power. Without the pivot fork the gears would spin freely and let all the tension go. 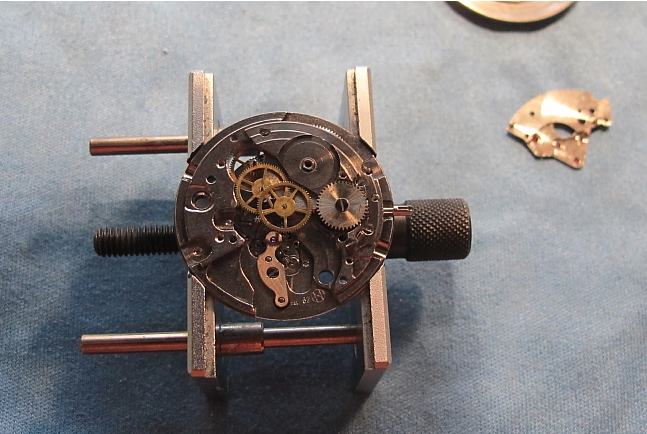 I put a little tension in the gears so that when I put the balance assembly back on the watch will start running. Then I know everything is lined up correctly. With the balance back on and the watch running, the rotor assembly goes back in it's proper place. On the front side, all the parts of the "keyless works" are reinstalled and lubed. Now the watch is ready for the dial. Note you can just see the female portion of the stem. 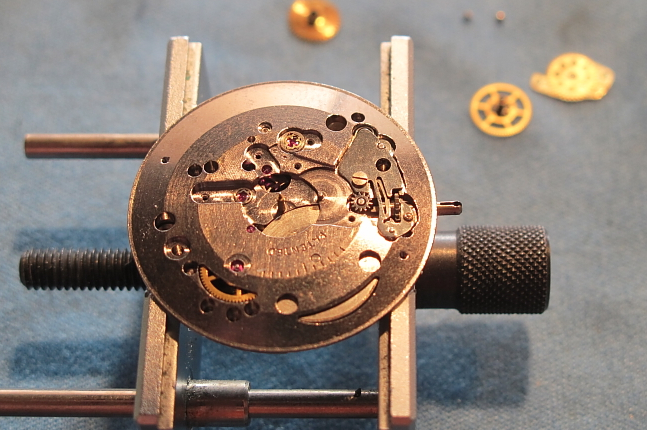 Putting the movement back in the freshly polished case is as much a pain as getting the darned thing out to begin with. With patience and persistence it all goes back in place eventually. Last step is to put the hands back on and the crystal. I check the timing when I reinstall the balance but I also check it when everything is back in it's proper place. 15 seconds fast per day... not too shabby. 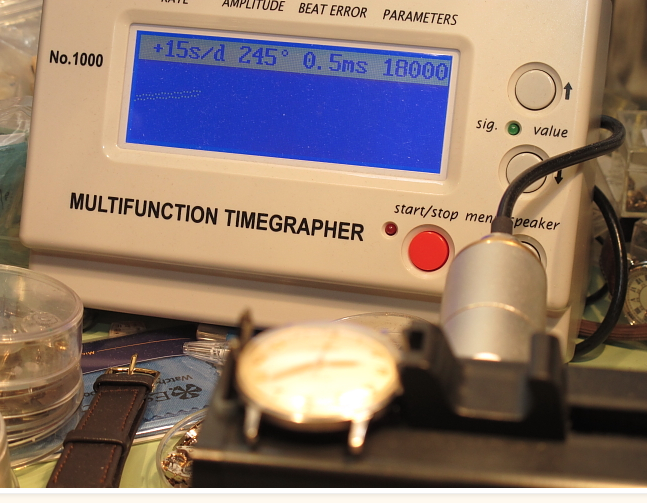 A lot of things can effect the timing of a watch and I try to stay within +/- 30 seconds per day. This one could probably be adjusted even closer to zero but that would require taking it apart again - and the risks from that outweigh the benefit 15 seconds per day. And that's it... good to go for another five years or so. This solves a mystery for me. 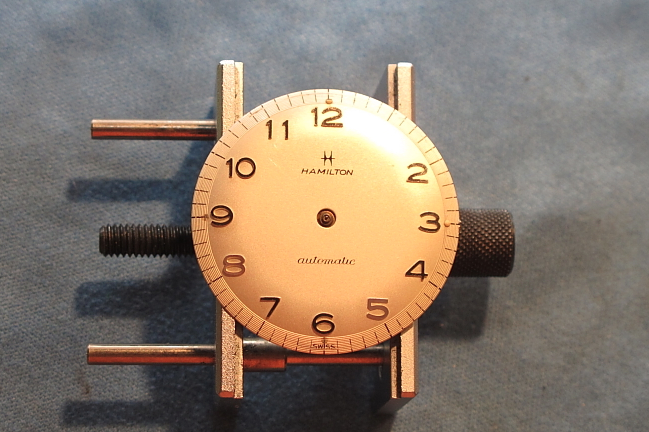 I'm looking all over a vintage Hamilton looking how to open it so I can see what the movement looks like. I'll skip it now that I see what must be done. It has a "25" on the face. 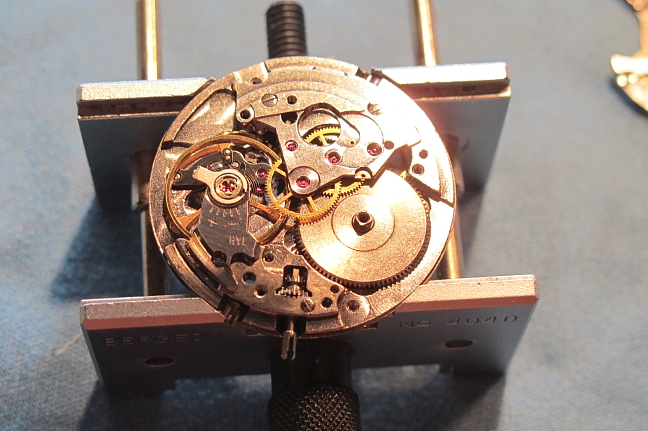 Do you know if in the mid-60s Hamilton made a 25 jewel manual movement? 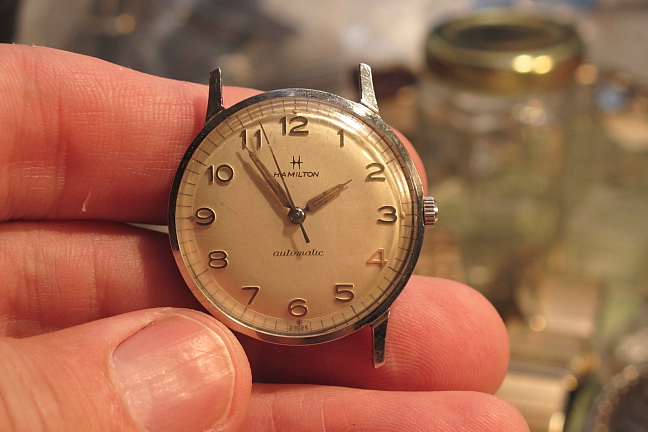 As a general rule, vintage Hamiltons never have the number of jewels on the dial. 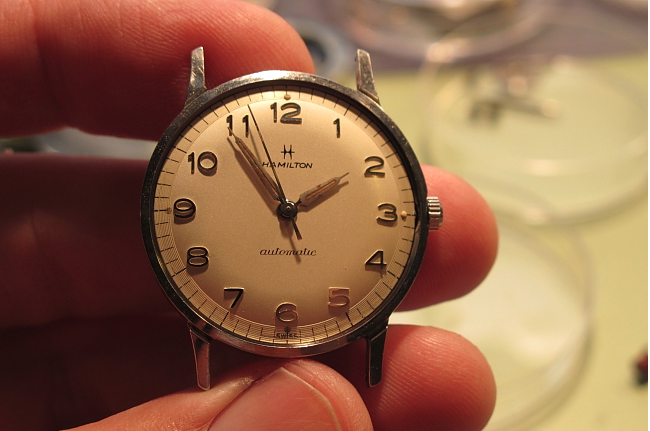 You will often come across vintage watches with Hamilton and something like "17 Jewels" on the dial - but this will virtually always be a jeweler-cased watch - meaning a Hamilton movement in a non-Hamilton case. 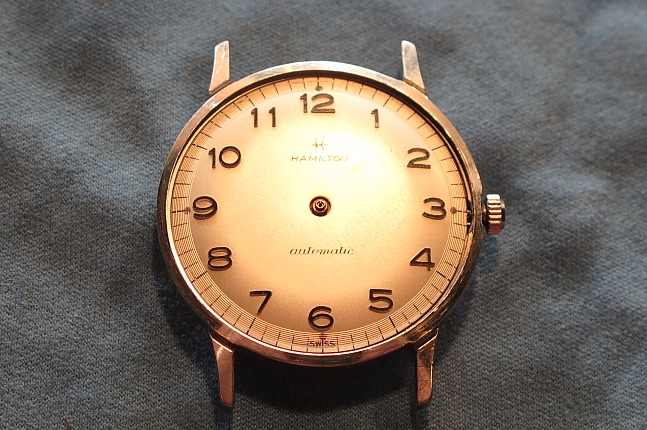 That said, there are 25 jewel automatic movements, especially on modern Hamilton watches like the Jazzmaster, et al. In your case, I would wonder if your watch is a presentation watch where 25 is the number of years service? That, or perhaps your watch is newer than you think and from the 1970's? When you get into the Swiss-made ETA movements there is a lot I do not know. But I'm not aware of any 25 jewel vintage movements. It is a presentation watch for 25 years of service. Is it true that by the 60s that was most of Hamilton's business? 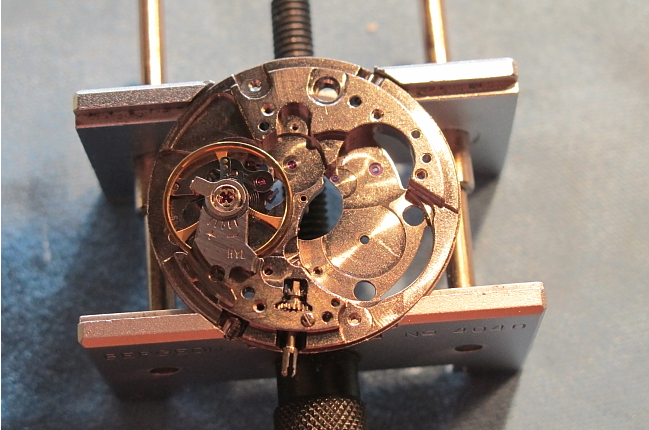 Care to guess what manual movement is inside a mid-60s Hamilton 33m x 10mm? Thank you for the information and the link. Thanks to you, I now know that I own a 1968 Accumatic A-510 in Stainless Steel. It is in great shape, running (gains 2 min/24 hrs. It has a sweep second hand, no date, and a plain crystal. Also thanks to your pictures, I can now see the word Swiss at the bottom of the dial. Do you think it would be worth oiling/adjusting at this point in its life? Would you like to place a value on this watch should I decide to sell it? I am now 63 years old and no longer wear the watch, and just don't know what to do with it. The oil inside a watch evaporates over time. Without oil, a watch will wear itself out if run dry. 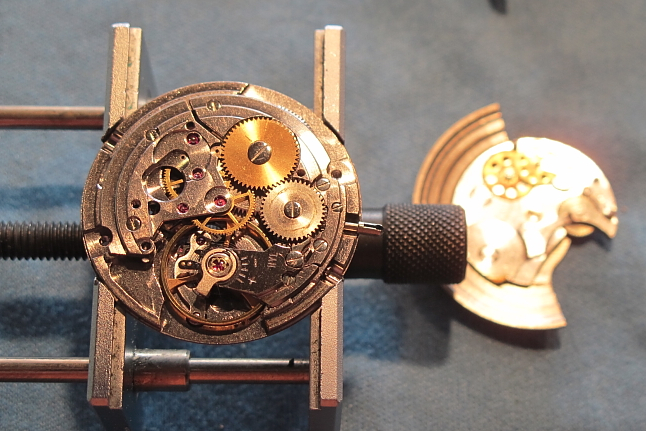 As a general rule, mechanical and automatic watches should be cleaned and oiled every 3-5 years - even if they appear to run fine. Properly maintained, they will last a lifetime. Of course, if you don't run it then you don't wear it out. So there's no harm in not servicing it. That said, it should cost you less than $75 to get it overhauled and return it to "like new" runability - if you did want to wear it occasionally. As for it's value - that depends on condition. With it's original bracelet and in good, recently-serviced condition it's a $200+ watch. On a strap and in serviced condition maybe $150 to $200. In "just found in a desk drawer" condition it's probably worth $75 or so (since it runs). Non-running, maybe $40. Thanks Dan! It's on a brown Lizard strap, which seems to fit the style of the watch pretty well. It does have a minor scratch on the back of the case, but the crystal is good. Would you do the overhaul for me? I'll pay shipping, not that I know where you are located. I'm in southern Ohio. 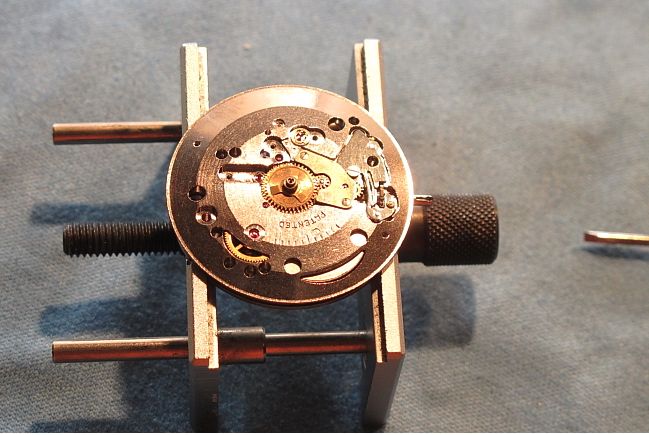 I am not a professional watchmaker, just a hobbyist. But if you want to email me (using the "click here to contact me link in the above right) I can give you a couple of recommendations for where you can send it to be overhauled. I'm guessing at this point that my email to you did not get through. Please check your email for the address that I sent with the request for info. Sorry John, nothing has come through and I even checked my spam folder. How about going to my etsy site and contacting me there? Thanks for your awesome article. I am working on a similar watch and am struggling to figure out how to remove the dial. How did you remove yours? I can't find any dial feet like I am used to seeing. Any suggestions are appreciated... and seriously thanks for posting such an interesting article. Look on the side of the movement at about 2:00 and 8:00. Awesome - found it. Thanks a ton. Resurrecting an older but absolutely fantastic thread here!! I just purchased an identical 502 from eBay for $65 and now I have all the info I need to get it back into shape again. Thanks so much for sharing all this.